With a top-ranked school system, low unemployment rate and frequent ranking as best place to live, retire or raise a family, Columbia County in east Georgia near Augusta, is certainly a desirable address. As such, the county continues to experience exponential growth, with many now referring to it as the “orange barrel community” because of the $200-million in road projects underway. Those plastic orange markers, however, are indicative of the rapidly expanding population that has leadership trying to keep up with roadways, infrastructure, education and housing to meet increased demand. It’s a fine juggling act, indeed, but decision-makers here are up to the challenge. 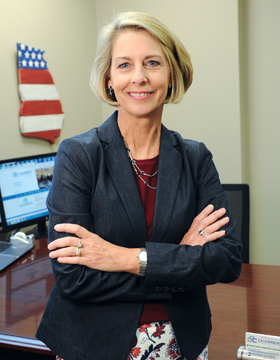 “We’re growing 5,000-plus people a year, and we desperately needed these road improvements,” says Tammy Shepherd, president and CEO of the Columbia Chamber of Commerce, of the multiple T-SPLOST-funded projects courtesy of the 2012 Transportation Investment Act (TIA) across the county. With some projects in full swing and others in pre-design phases, Columbia is currently the 28th fastest-growing county in the United States, she adds. Because an estimated 70 percent of the local workforce leaves the county every day, headed to jobs at the Savannah River nuclear site in Aiken, S.C., or in neighboring Richmond County, traffic flow had become a major problem. The 10-year T-SPLOST is projected to provide more than $164 million for the widening of eight major corridors in the county, including the completion of Riverwatch Parkway to Washington Road, a $36-million project more than a decade in the making, says Shepherd. “The [TIA] is a godsend to Columbia County,” says County Commission Chair Ron Cross, now in the second year of his fourth term and a member of the regional transportation committee that pushed to get the one-cent tax approved in 2012. Another major need in the county is a hospital, says Shepherd, noting Columbia is the highest populated county in the state without a hospital or emergency room. The state awarded the Certificate of Need and the contract for a $150-million, 100-bed hospital in Grovetown to Augusta University Medical Center, which plans to make it the most technologically advanced hospital in the nation. Other infrastructure needs due to rapid growth are water and sewer. As developers put the systems in place and deed them over to the county, it’s constantly growing, says Johnson, who estimates the county will make about $40 million in improvements, in addition to what the developers are doing, by the year 2020. Additional county projects, funded primarily with a second SPLOST that’s set to expire this year, include a new state-of-the-art animal control facility, a new health department building, numerous public park improvements and a courthouse renovation to include three additional courtrooms. While many want to credit the growth to the relocation of the Cyber Command Center to Fort Gordon in neighboring Richmond County, there’s more to it than that, says Shepherd. While cyber contractors and other cyber support companies flock to the area, so do other unrelated businesses. The biggest project currently in the pipeline is a $65-million public/private partnership with Meybohm Realtors for the development of The Plaza at Evans Towne Center. Featuring more than 300,000 square feet of new retail and office space, it will be anchored by the new Performing Arts Center, says Robbie Bennett, executive director of the Development Authority of Columbia County. In addition, Meybohm will locate its Columbia County headquarters within the development, bringing 120 agents and staff. Bennett hopes to see completion of Phase 1 – roughly 96,000 square feet – by early 2018. Over the past year, GIW Minerals has finalized its $37-million expansion, adding a new foundry, a warehouse and 50 jobs to the area. Seventy new jobs were created by Serta-Simmons Bedding when it added a second shift earlier this year. Evans-based TaxSlayer was awarded a $26-million five-year contract earlier this year to provide software services for the IRS. Once it takes effect in 2017, it will enable TaxSlayer to grow its seasonal workforce from 225 to 300 or more. In 2015, Hoback Investment announced the construction in Grovetown of a 524,700-square-foot warehouse, one of the largest in the region. Set to open this fall, the $24-million facility will be operated by Bennett Distribution Services, a third-party logistics provider, and will warehouse product for manufacturing at John Deere Commercial Products, says Bennett. Given the growth of the film industry in Georgia, Film Columbia County was established in March, a joint venture between the board of commissioners, the development authority and the Columbia County Convention and Visitors Bureau to help market the county as a film location. Quad Graphics closed its doors in early 2016, taking 246 jobs from Columbia County, but those employees were quickly absorbed by other area manufacturers. The Columbia County School System continues to rank among the Top 10 in the state, says Associate Superintendent Jeff Carney. The high level of performance continues to be maintained while exponential growth prompts the construction of a new school every year. And with student enrollment projected to increase by another 500 students to 26,500 for the 2016-17 school year, construction won’t slow down any time soon. “We’re pretty accurate with our projections. We try to do it conservatively, so we’ll definitely hit that this fall,” says Carney. The growth is attributed in part to new jobs at the Savannah River site, as well as in Augusta, whether industry jobs or with Medical College of Georgia, for example. Many who work in neighboring Richmond County choose to live in Columbia County for the schools, he says. In addition, as Fort Gordon continues to bring in personnel for its Cyber Command Center, many are also choosing to live in Columbia County because of the school system’s stellar record. About 17 percent of the system’s students are from military families, says Carney. The Cyber Command Center has impacted the school system in ways other than enrollment. Discussions with Fort Gordon about providing a qualified workforce for the future resulted in the addition of a three-course Cybersecurity Pathway that attracted 40 to 50 students last year and will be offered at a fourth high school this fall, says Carney. Curriculum ranges from introduction to infrastructure in the first course through learning good and bad hacking techniques in the third course. “By the third course, it’s serious … they have their own network set up in the classroom. We can’t even have our system network tied to it because they get in there and really learn about hacking,” says Carney, adding that Greenbrier High School won the Georgia CyberPatriot State Competition after its first year in the Cybersecurity Pathway. In fact, two of the school’s three teams finished first and second in the event. The school system in June passed a $211.5-million budget, says Carney, a portion of which will be used for technology improvements like upgrading the system’s network. “It’s like we’re going from a two-lane road to a 10-lane interstate,” he says. The budget will also afford hiring a director of digital learning, the one area the system can improve upon. CVB Executive Director Randy DuTeau continues to attract large national events to the county. In the past three years, he has brought three high-profile events: the AAU Cross Country National Championship, the USA Cycling Marathon Mountain Bike National Championships and the U.S. Adventure Racing Association National Championship coming this October. With resources such as Clarks Hill Lake, the Savannah River and a great parks system, in addition to a climate that allows nearly year-round outdoor activities, Columbia County is an easy sell, says DuTeau. “Aside from the economic impact, events such as the mountain bike championship are great exposure and create a platform to let the public know about the mountain bike trails we have. The trails aren’t just for athletics and sports, they’re also for recreation,” he says. The CVB has also worked to expand one-day events with additional offerings to keep visitors in town longer. As outdoor adventure options expand, such as the Benderdinker paddling, music and food festival that attracts about 1,000 paddlers to the Savannah River in April, the county is seeing an increase in local vendors offering kayaking tours and rentals. In addition, county leaders are pushing for development of a 150-room hotel at the Columbia County Exhibition Center, boosting Columbia’s appeal for meeting and convention business. The smaller towns in Columbia County are also busting at the seams. Grovetown’s population has nearly doubled to 13,000 over the past decade, says Frank Neal, planning and development director. Keeping up with infrastructure has been the biggest challenge. The town sits right outside the back gate of Fort Gordon, and two of the road improvement projects will improve traffic flow from the base to the interstate, says Neal. Grovetown, also the location for the proposed hospital, recently received approval for a $25-million state-of-the-art wastewater treatment plant to replace one built in 1977. Projected completion is the end of 2018, he says. Meeting needs for residential growth, the town adopted an award-winning urban redevelopment plan to revitalize the inner-city areas, improving both residential and commercial to create a “true downtown,” says Neal. In nearby Harlem, City Manager Jason Rizner says the recently approved $5.5-million library will be a game changer and bring some new life into downtown. “This may be the biggest project we’ve ever had,” he says of the nearly 15,000-square-foot SPLOST-funded facility that will anchor a new town center with greenspace. Other bright spots for Harlem’s future include the construction of a $1-million gate to Fort Gordon in close proximity to Harlem and the efforts of the Harlem Urban Redevelopment Agency, a group of local residents and business owners charged with revitalizing downtown and identifying businesses they want to attract. As progressive as Columbia County has been in keeping up with recent growth, proactive county leaders are already prepared to tackle the next two decades – now. Adopted by the Columbia County Commission earlier this year, Vision 2035 is the blueprint for future development, says Cross. The plan, which would be funded by general obligation bonds, includes development maps as well as supporting goals and implementation strategies that address population growth, housing, economic development, land use and development, transportation and community facilities. “It will give the public an opportunity to accelerate some of the things they’ve said they want,” says Cross, including additional parks and some road improvements not part of the TIA project list. Implementation of Vision 2035 will be decided by Columbia County voters in a November referendum. There certainly are a lot of plans and initiatives in the works, but Columbia County has proven that it’s up to the challenge. The Other Golf: Neighboring Augusta may be home to arguably the most venerable of the American golf tournaments, The Masters, but Columbia County has its own golf claim to fame. The town of Appling boasts the Professional Disc Golf Association (PDGA) and the PDGA International Disc Golf Center. The PDGA was founded in 1975 by the father of disc sports, Edward “Steady Ed” Headrick, who also designed the modern Frisbee and invented the disc golf basket used on official courses today. The center’s Superintendent Zach Shafer says the PDGA serves as the global governing body for professional disc golf, overseeing sanctioning, rules and insurance while serving as a resource for tournament managers and helping to maintain a standard of excellence. The center also offers three championship-level 18-hole disc golf courses. All three courses rank in the top 25 in the world. “We’re definitely up there as far as prestige goes,” says Shafer.